The Aquis CPR-1 System can remediate corroded HVAC condensate pans without replacing the pan or unit. This antimicrobial system slopes and seals the existing condensate pan. 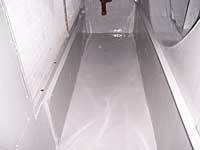 This eliminates standing water, halts rust, stops leaks and abates the growth of mold and bacteria. CPR-1 has no detectable odors or VOC’s, increases the service life of mechanical AHUs by 10 or more years, and is fully compliant with ASHRAE, NFPA, IMC and EPA.